“These are the type of people that business, industry and the government would hire. This is the cream of the crop,” said Michael Bender, a research scholar at the Laboratory for Analytic Sciences at North Carolina State University. 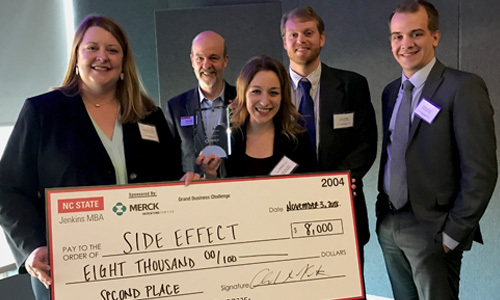 Bender was one of 16 judges for the third annual NC State Grand Business Challenge, hosted by the NC State Jenkins MBA program in the Poole College of Management in Raleigh, N.C., and sponsored by Merck. The three-day competition, held November 1-3, 2018, at the NC State Alumni Center and Hunt Library on the university’s Centennial Campus, provides MBA students an opportunity to challenge their strategic, creative problem solving skills and also provides select recruiters a chance to meet potential new employees. Twelve teams of MBA students from business schools across the United States, as well as Prague and Singapore, arrived at NC State on Thursday, November 1, ready to put their knowledge to work as they vied for cash prizes ranging from $2,000 for the fourth place team to $16,000 for the first place challenge winners. Prizes were also awarded in a poster competition. Merck’s goal with the competition, he said, “is to increase awareness of cybersecurity, to get our business leaders of tomorrow to start thinking about cybersecurity in a different way. Many think of it as an IT problem, but it’s really a business problem, and accountability goes all the way up to the board of directors,” he said. “The teams’ challenge for the next 48 hours was to develop an actionable strategic response to a hypothetical – but in today’s world not improbable – cyber security attack that disrupted company operations,” Porter said as the competition was getting under way. “Their recovery plan had to address the diverse issues that might follow such an attack, ranging from employee safety to technology infrastructure and regulatory compliance,” he said. In addition to Merck, this event is sponsored by Securonix, Splunk, Cisco and Exostar, who participated in a recruiting event held in conjunction with the competition. 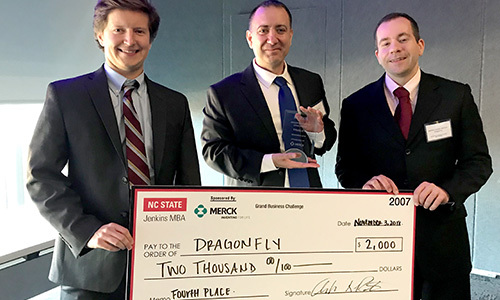 2018 NC State Grand Business Challenge winning teams. First place: The Johns Hopkins University Carey Business School, Washington, D.C. 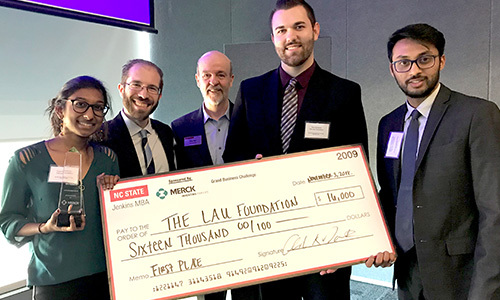 Team members Priya Arunachalam, Abhinav Chintakunta, Benjamin Schneider, and Paul Simpkins competed as The Lau Foundation team. Second place: Texas Christian University, Fort Worth, Texas. Team members Kyle Carter, Rachel Manthei, Amanda Pape and Jason Stacking competed as the Side Effect team. Third place: Terry College of Business, University of Georgia, Athens, Georgia. 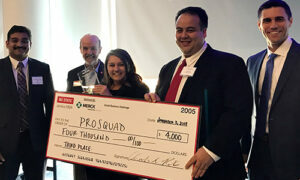 Team members Scott Giveans, Ratna Balaji Govindarajan, Megan Grandin and Tyler Miyawaki competed as the ProSQuad team. Fourth place: College of Business, Rider University, Princeton, New Jersey. Team members Ryan Dickerson, Eric Marino and Matt Van Horn competed as the Dragonfly team. This is the second time a Carey Business School team has competed in the challenge. Three of the 2017 team members returned for this year’s competition, joined by Paul Simpkins. The team name – The Lau Foundation – is a reference to a team member who had stepped down the previous year to comply with the competition’s four-person limit on team size, Arunachalam said. His last name was Lau, and while he could not participate this time, his colleagues named the team in his honor. Teams also had an opportunity to participate in a poster competition, in which they were asked to expand on one of the points raised in the Grand Business Challenge: What additional steps could institutions take to create more effective partnerships to reduce costs? And beyond partnerships, what alternative methods might cut costs associated with, or reduce the occurrences of, cyber-attacks? 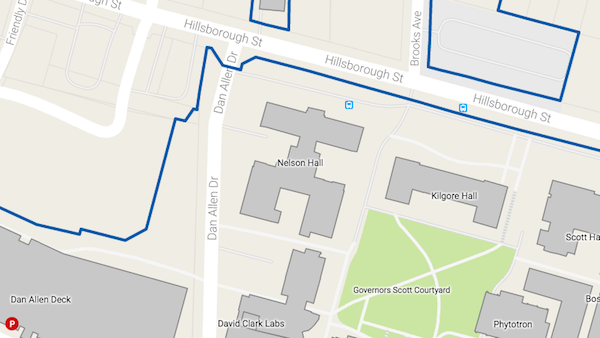 Third Place, $300: Clemson University College of Business, Clemson, S.C. Team members Jamilah Abdi, Jillian Davis Gaskins, Nadeen Qubti and Carissa Robinson competed as the Domin8 team.